In 2014 we introduced the Business Support Finder API as a public prototype. The API lets people and organisations reuse GOV.UK’s in-depth database of information about UK business grants, loans and other financial assistance in their own way, and tailored to the needs of their own audiences. This direct access to the data can be used to power applications without the need to replicate the data itself. We’ve come to the decision that as of April 2017, the API will be deprecated. In this post, we’ll explain why we’re doing this, and the dates you need to know. The Business Support Finder API endpoint has been available since 2014, but has only ever been a custom component within GOV.UK’s systems, running as a prototype without any official support. We haven’t considered fully supporting the API because it has seen so little use. 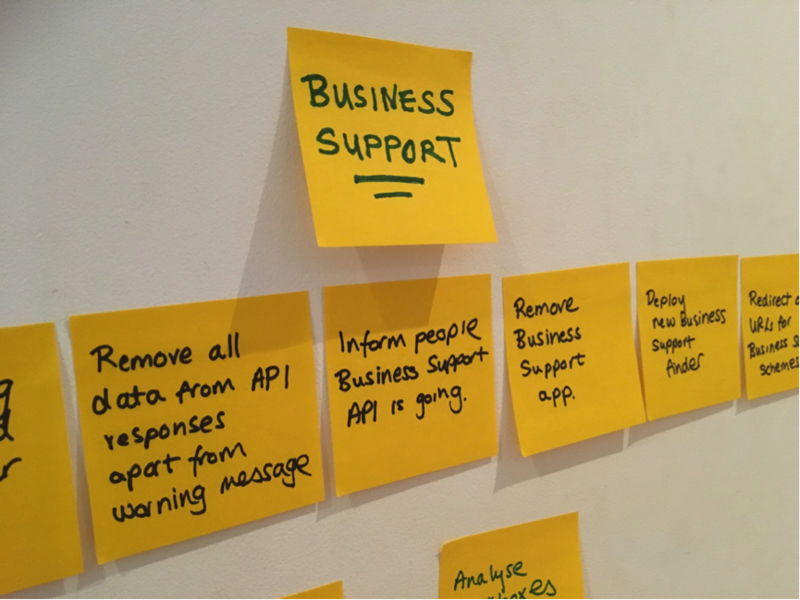 Now changes to the GOV.UK architecture means we’ve had to reconsider how we provide business users with access to information through an API (read below to see what we’re doing next). As part of our continuing work to migrate formats to our new Publishing Platform, we have moved Business Support content to our rebuilt Specialist Publisher application. We will now be deprecating, and then removing the Business Support Finder API endpoint. We will maintain the existing API functionality until Tuesday 24th April, although once we’ve moved all content to Specialist Publisher, the content returned by the API will no longer receive any updates. We will add notices to both the response body and headers saying the API is deprecated and is due to be turned off. After the 24th April, the API endpoint will continue to accept requests, but will no longer return content, and will return a “204 No Content” HTTP status code. After the 8th May, the endpoint will be removed entirely, and will no longer accept requests, responding with a “404 Not Found” HTTP status code. What’s next for Business Support content? As part of our 2017-18 roadmap, we’re going to be publishing a supported, public API for GOV.UK’s content, and the Business Support content will be included in that, so watch this space. You can follow Tim on Twitter, sign up now for email updates from this blog or subscribe to the feed.